Hello, lovely readers! I have a special surprise for you this month. You Instagrammers have no doubt noticed me mention a collaboration with this brand, but it's finally here for all to enjoy. I've partnered with furniture and accessories brand Oomph to offer you the opportunity to not only win one of their marvelous products, but design it yourself. Do you know Oomph? If not, brace yourself for a fresh look on furniture design. This specialty brand offers color and customization in ways you rarely find at price points like theirs. From lacquered tables (like these) to incredible lighting or statement-making upholstery, Oomph puts you in control of the design process. What does my giveaway entail? Everything your custom loving heart desires: You'll be able to choose from several unique shapes of their popular Tini Table and design it to suit your cravings. Select from 16 amazing glossy colors and 10 incredible tabletop surfaces to create the precise table you love. These versatile little occasional tables can be used almost anywhere in the home you might imagine. Use one chair side or use one on each side of the sofa. The rectangular ones are terrific in narrow spaces as they are only 8" in width. Amazing! Those of you with more abundant space might opt for the quatrefoil shaped IV which is measure 18" deep and wide. There are round, square and oblong shapes to choose from as well. Which one suits you best? Fortunately YOU get to decide that yourself! This is one of those rare occasions when a product truly can be styled to suit your preferences. And don't let those festive Trina Turk colors at the top fool you. Oomph offers finish & surface options that span the range of wild to mild and everything in between. Just look at these posh samples below. Dreamy! My favorite combo? I'm a classicist to a fault, so although I can see my future Palm Beach self owning the tangerine or hot pink version with a raffia top (so chic!!)... 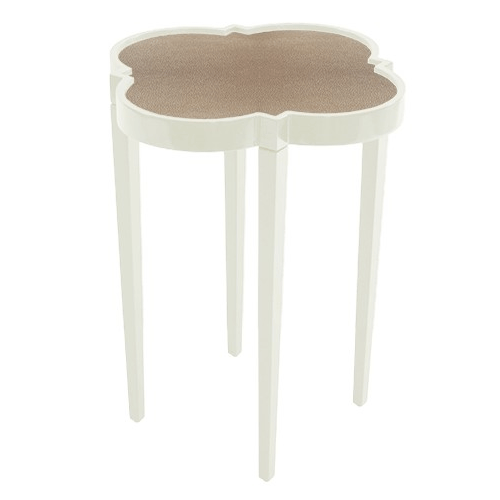 for my present life I am loving this quatrefoil shaped option in cream with a tan shagreen top. It is just so positively chic and will go with everything I have now and anything I'll obtain in the future. I just LOVE this table and think it is utterly sophisticated. But you, dear design lover? What does your heart desire? You may crave a walk on the wild side and pine for those zebra stripes. Or how about a zesty yellow version with a similarly painted top? What about a white lizard top on acid green legs? Have you ever seen a robin's egg blue table? Now is your opportunity to make those furniture dreams come true. Their web site makes this even easier by displaying on-the-fly photos of the options you select. No guesswork needed. So... how do you win? Simply tell me why YOU need a little Oomph in you life via the comment section below. Does your living room need a lift? Is your nursery almost complete? Is the mother-in-law suite being built this fall? Just share with me why you'd love to win a little Oomph for your home. That's it! Because I feel this giveaway is a bit special I'm keeping it active until September 30th at midnight. Enter once, enter twice... just be sure to enter. If you have questions about the tables, be sure to ask me, I'll get them answered for you. Also... be on the lookout for more Oomph posts as I will interview the owners themselves soon. 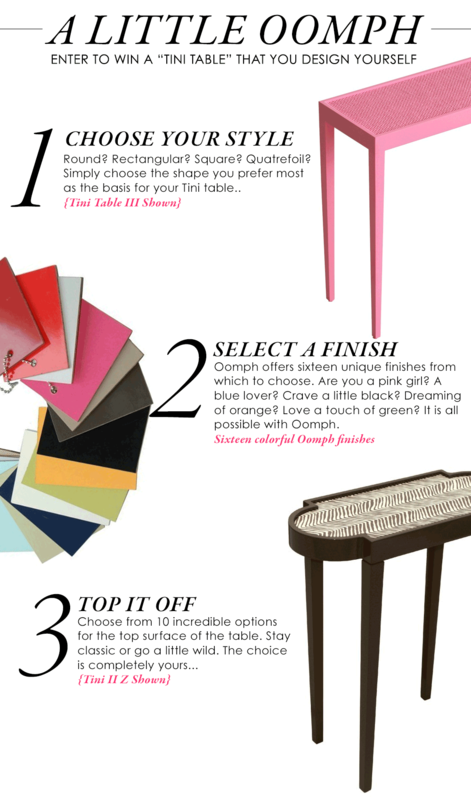 Happy commenting and don't forget to pop over to Oomph design the Tini Table you love most.